Preheat oven to 275Â°F. 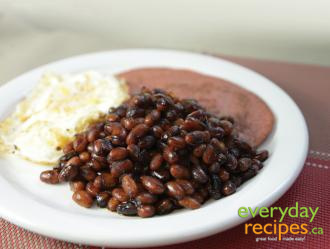 Soak beans in cold water overnight. Drain beans and add to pot with onion and enough fresh water to fill the pot an inch higher than the beans. Boil the beans until soft. Drain and add to casserole dish. In a bowl, combine mustard, maple syrup, molasses, brown sugar, ketchup and lemon juice. Add sauce to beans, stirring to completely coat them. Mix in diced bacon and season with salt and pepper. Bake for 3-4 hours, or until beans are thoroughly cooked and sauce is thick.